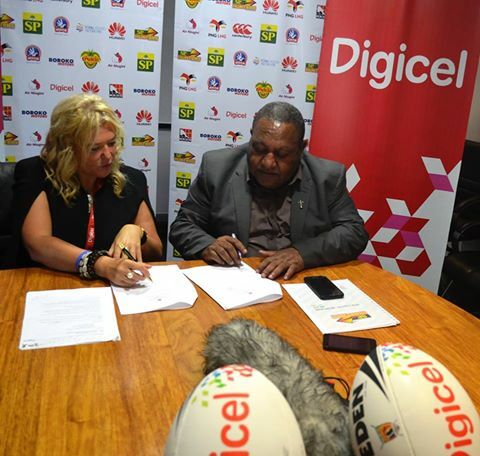 Digicel is pleased to announce the commencement of another long-term landmark sponsorship agreement with the PNG Hunters under the Papua New Guinea Rugby Football League (PNGRFL). Beginning in November 2016, the three-year sponsorship deal will see Digicel step into the dual role of Exclusive Telecommunications Sponsor as well as Platinum Sponsor. This is the second term of the platinum agreement and marks the first time the PNGRFL has had an exclusive telecommunications partner, a title Digicel Retail Director, Lorna McPherson, says they are thrilled to take on. “Digicel is thrilled to line up beside the world’s most passionate rugby league supporters and cheer on our home grown team, the PNG Hunters,” she said. “This is the start of another exciting three-year relationship between Digicel and the PNGRFL. PNGRFL Chairman, Sandis Tsaka said he was confident that the league would flourish under the partnership. “Digicel has demonstrated time and time again a genuine commitment to supporting initiatives, events and groups that are important to Papua New Guineans,” he said. PNGRFL was established in 1974 and are the governing body for Rugby League in Papua New Guinea. The organisation’s primary role is to promote and develop Rugby League in PNG as well as manage the country’s national Rugby League Team the Kumuls and the Hunters, who compete in Queensland’s Intrust Super Cup competition.